"It’s interesting to see how this works. 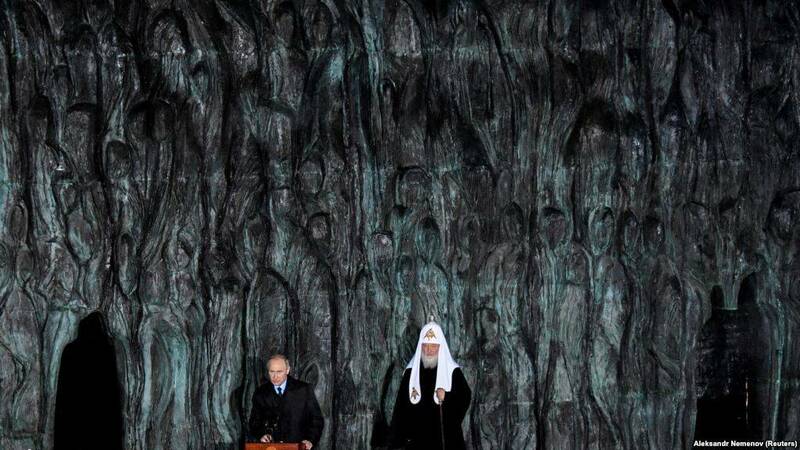 Putin unveils a monument to Stalin’s victims, but Western reporting doesn’t focus on that, nor link it to other memorials which repudiate communism (Butovo, Sretenskii, etc), but instead uses the event as what journalists call a ‘hook’ to write a story about political repression under Putin and the Russian state’s alleged rehabilitation of Stalin." Monuments and memorial plaques honoring Stalin have sprung up in different Russian regions. State-approved textbooks have softened his image, and an opinion poll in June crowned him the country’s most outstanding historical figure. By contrast, those who have helped document Stalin’s crimes, from the Memorial human rights group to individual historians and journalists, have sometimes felt themselves under pressure from the authorities. The BBC notes that Putin said that, ‘An unequivocal and clear assessment of the repression will help to prevent it being repeated,’ and that, ‘This terrible past must not be erased from our national memory and cannot be justified by anything.’ But it then qualifies this by finishing with the words, ‘In June, President Vladimir Putin warned that Russia’s enemies were “demonising” Stalin excessively. Under his rule, the Soviet victory over the Nazis has become central to a new ideology of Russian greatness.’ As with Reuters, a story about Putin condemning the crimes of Stalinism thus gets turned around and becomes a story about Putin ‘crushing civil freedoms’ and indirectly promoting the Stalin cult. It’s interesting to see how this works. Putin unveils a monument to Stalin’s victims, but Western reporting doesn’t focus on that, nor link it to other memorials which repudiate communism (Butovo, Sretenskii, etc), but instead uses the event as what journalists call a ‘hook’ to write a story about political repression under Putin and the Russian state’s alleged rehabilitation of Stalin. And the sources it cites are the likes of Sobchak and Kasparov.ru, who represent a tiny and extreme fringe of Russian public opinion. Unfortunately, this is all too typical of how Russia is reported. Caveat Emptor, as the saying goes; or to put it another way, let the reader beware.